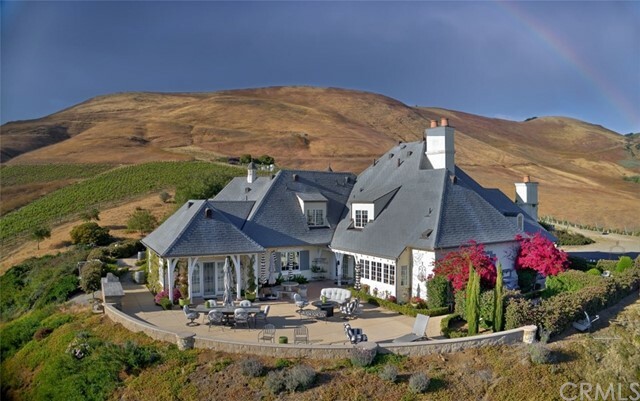 Old World Style Vineyard Estate on 95 Acres. This magnificent 4100 plus sq. ft. home has endless views of the Pacific ocean, coastal mountains and vineyards. An open family room and gourmet kitchen has french doors for access to the extensive patio area. The gourmet kitchen is furnished with Dacor Commercial Stove and built-in Kitchen Aid refrigerator and dishwasher. Formal living room and dining room are open and each have a fireplace. Two additional fireplaces are in the house one in family room and the other in the library. Upstairs you have a fourth bedroom in addition to two mini master bedroom suites as well as an office. Radiant heat downstairs with forced air upstairs and central air throughout. Master Suite is on the main floor with view. Wet bar and wine storage area. Also has separate 508 sq. ft. guest quarters with bathroom and shower located in the barn/shop. The vineyard produces Pinot Noir grapes on 12 acres known as Aubaine Vineyard. Numerous wells see attachment. This is an incredible property that words and pictures cannot begin to describe.